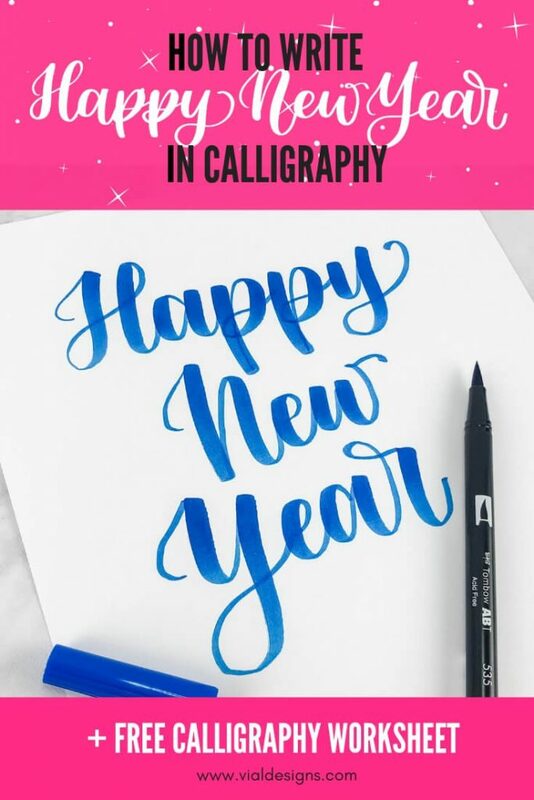 Happy New Year Calligraphy tutorial plus FREE calligraphy practice sheet. The truth is that the only way you’ll get better at calligraphy is by practicing. 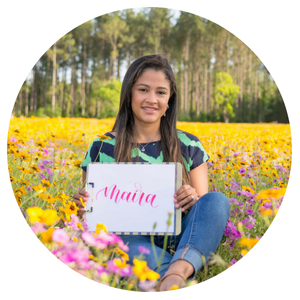 So I want to kick off the new year helping you with your calligraphy practice. Last month, I decided to start creating free calligraphy practice worksheets for you to practice along with me. In December, I choose “Merry Christmas.” as the free calligraphy worksheet of the month. You can find the practice sheet in my resource library. Today’s worksheet will in resource library there as well, and you can get access to it by filling out the form at the end of this blog post. If you have a word or phrase you’d like to use to practice your lettering, let me know in the comments. I’ll be choosing new words every month. Let’s get to the calligraphy tutorial and how to use the free calligraphy practice sheets. 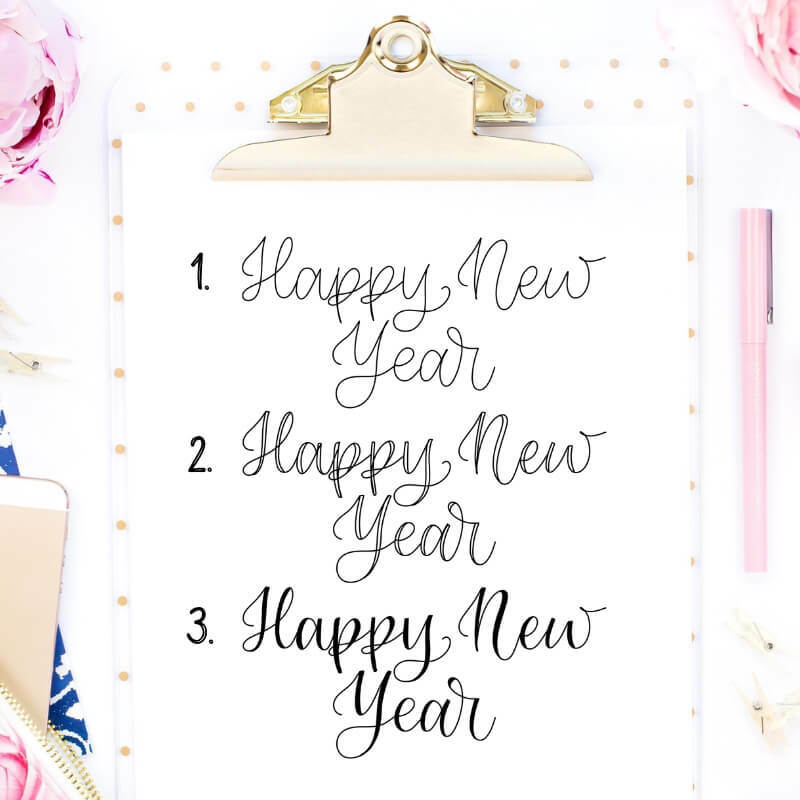 In this tutorial, I’ll show you three different ways you can write “Happy New Year” in modern calligraphy. You’ll need the suggested pens below as well as my calligraphy practice sheet, which I’ll show you how to get it at the end of this blog post. Faux calligraphy. Suggested pen: Tombow Twintone markers. But any pen of your choice will do. Small brush pens. Suggested pen: Tombow Fudenosuke Hard or Soft tip. You can also use Pentel Fude brush pens. Large Brush pens.Suggested pen: Tombow Dual brush pens. Another great option is the Artline Stix Brush Markers. 1. 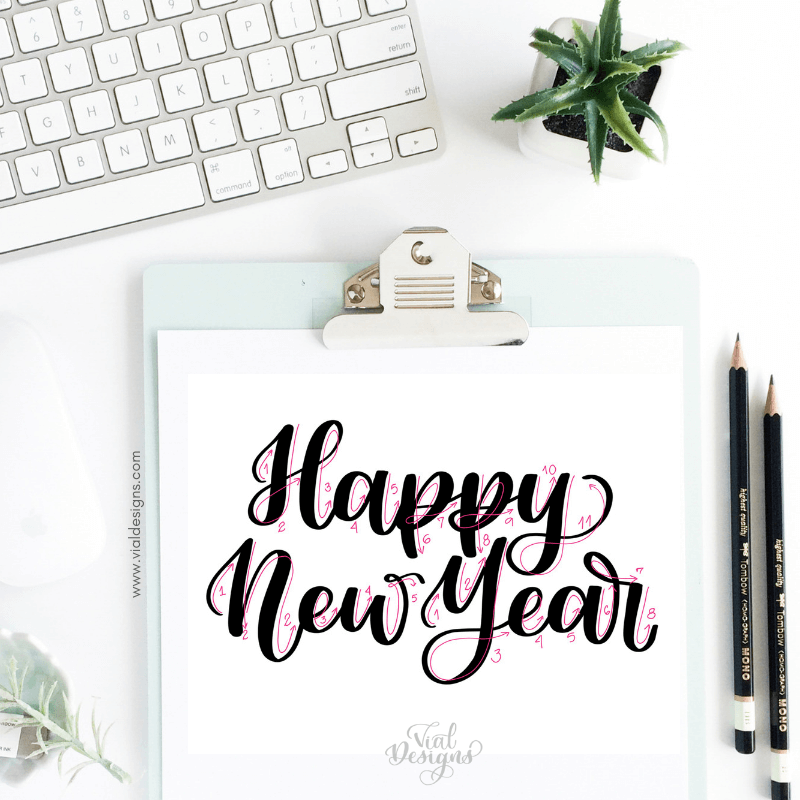 HAPPY NEW YEAR CALLIGRAPHY TUTORIAL: FAUX CALLIGRAPHY. The first part of the tutorial is doing Faux Calligraphy. I always recommend learning faux calligraphy before you move on to calligraphy with brush pens or pointed fine pens. I like to use the Tombow Twin Tip Markers for Faux Calligraphy. But you can use whichever pen you prefer for this first part of the calligraphy practice sheet. If you’d like to know more about Faux Calligraphy and why you should learn it first, then check this blog post. This other blog post gives you a detailed step-by-step tutorial on how to do Faux Calligraphy, which also has a free worksheet to help you get the basics of Faux Calligraphy down. First, you’re going to trace the “Happy New Year” using the pen of your choosing. Pay attention to how you move your pen, keeping in mind that when you move your pen down is where you will need to add outlines to thicken the downstrokes. 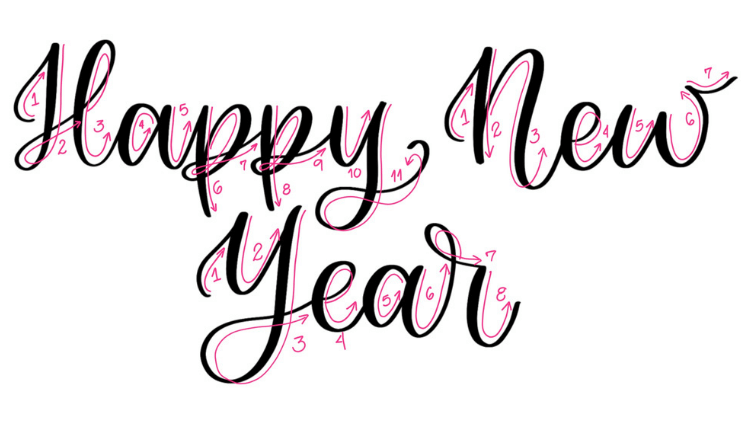 Second, you’ll continue to trace the “Happy New Year” and add the outlines to the downstrokes. Third, you will complete the same steps above, and this time you will fill in the outlines. That’s it! This part of the tutorial is done! You’ve created calligraphy using any pen. The second way of doing “Happy New Year” in calligraphy is by using a small tip brush pen. The small brush pen I recommend to use with this part of the worksheet is a Tombow Fudenosuke Hard Tip. Pay attention to the “Happy New Year” sample above. I broke each letter down and numbered the strokes you need to make to form the letters. Keep in mind that every time your brush pen goes down you press hard and when your pen goes up you lighten the pressure of your pen. 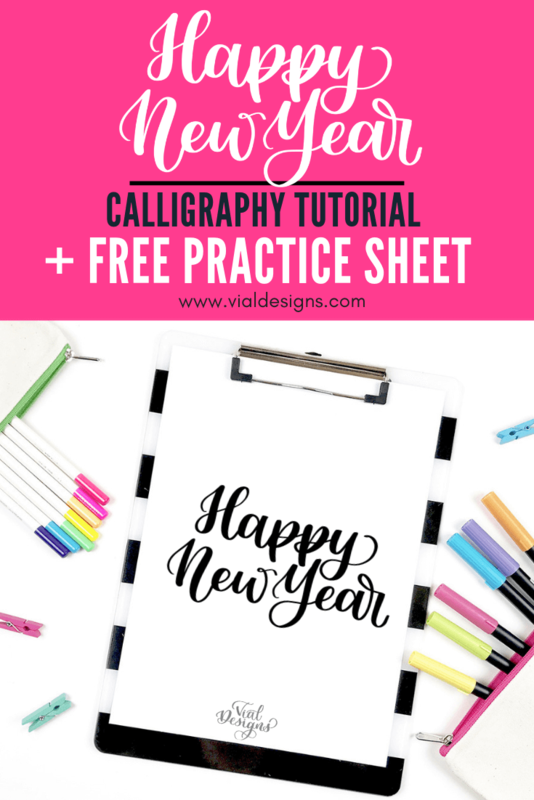 Using your small tip brush pen on your practice sheet, trace over the “Happy New Years.” You’ll do the same for every “Happy New Year.” Print as many pages as needed for extra practice. Last part of this calligraphy tutorial, is writing “Happy New Year” using a large tip brush pen. The pen I recommend with this part of the worksheet is a Tombow Dual Brush Pen. But you can use any large brush pen of your preference. Same as the small brush pens, I broke each letter down and numbered the strokes you need to make to form the letters. The reason I counted the steps and broke down the phrase into strokes is that in calligraphy you need to pause as you’re writing the letters. You don’t write them continuously as you’d when you’re writing in cursive. Those are the three different ways you write “Happy New Year” in calligraphy, using a regular pen, a small brush pen or a large brush pen. You can get access to these practice sheets for FREE by filling out the form at the end of this blog post. By giving you three ways to practice with this worksheets, there is no excuse not to do it. You can practice using all three methods, or just with the pen, you have available at the moment. HOW TO USE THE FREE PRACTICE WORKSHEETS? The worksheet will be an instant download, and you can print it at home or a local printer store or library. I use this inexpensive laser printer to print mine. (This printer is black and white. But that’s all you need at the moment to print the practice sheets). To use any of your brush pens, make sure you print the worksheets using quality paper. The paper I recommend is HP Premium32 Paper. You can use any printer paper if you are using a regular pen. I hope you have fun practicing and learning calligraphy using these practice sheets. Be on the lookout for next’s month’s free practice sheets and don’t forget to comment with your word or phrase suggestions. WANT TO REMEMBER THIS? 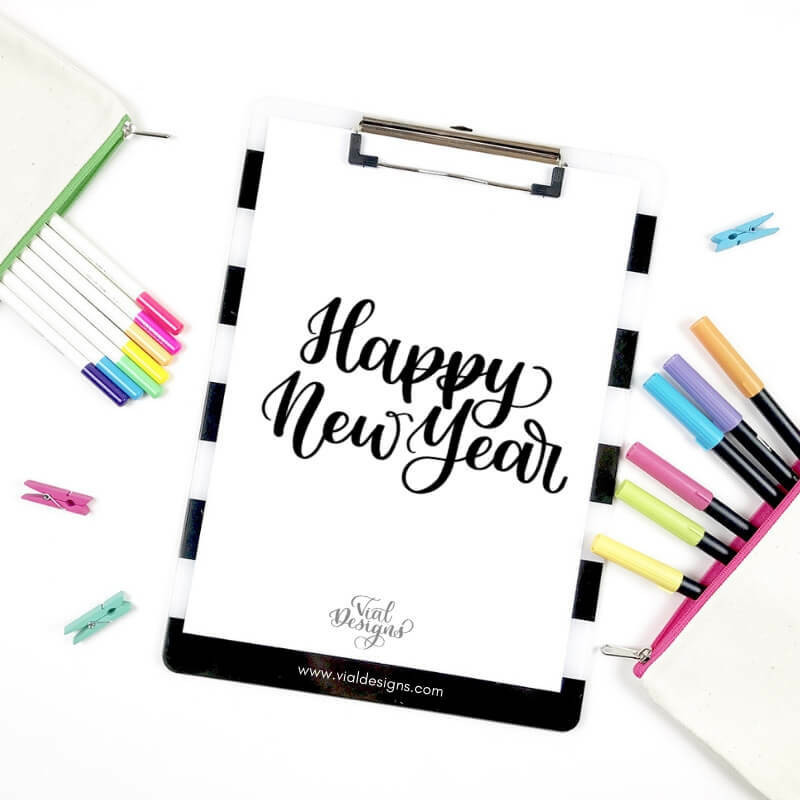 SAVE THIS FREE HAPPY NEW YEAR CALLIGRAPHY WORKSHEETS TO YOUR FAVORITE DIY PINTEREST BOARD!